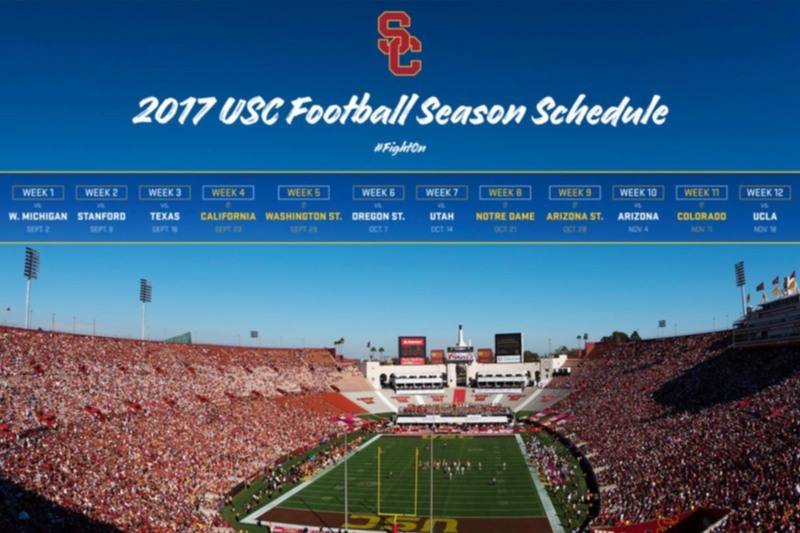 The 2017 football schedule for defending Rose Bowl champion USC has been announced by the Pac-12 and it features seven home games in the Los Angeles Memorial Coliseum. The schedule features three straight home games to open the season, including a rare visit by Texas, and the regular season finale against crosstown rival UCLA. Also visiting the Coliseum will be Pac-12 opponents Stanford, Utah, Arizona and Oregon State and non-conference foe Western Michigan. Overall, USC’s 12-game schedule features five teams that played in bowls this past season and won at least eight games. The Trojans will play nine league foes in the 2017 regular season (all but Oregon and Washington). However, for the first time since the 1995 season, the Trojans will not have a regular-season bye week, only getting a week off on the final weekend of November should they advance to the Pac-12 Championship Game on Dec. 1 or 2 at Levi’s Stadium in Santa Clara. New season tickets, starting at $320 for all seven home games, are now available for purchase online or by calling 213-740-GOSC (4672). Current season ticket holders can renew their tickets now by going to the USC Athletics website and clicking on “Manage My Account” under football.